And so far, Pratchett has been right. Despite the right director, Terry Gilliam, Good Omens seems perpetually put on the back burner but is not dead. Even during interviews for his mesmerizing The Imaginarium of Doctor Parnassus, Gilliam said the prospect was still promising. The primary hold up is finding someone willing to foot the bill. The secondary hold up is whether Hollywood will eventually concede that the end of the world can be funny. It has been for 20 years. 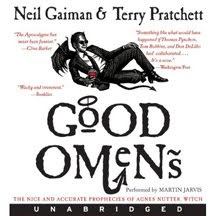 Good Omens: The Nice and Accurate Prophecies of Agnes Nutter, Witch is the funniest retelling of the end of the world, ever. It even comes with a disclaimer: Bringing about Armageddon can be dangerous. Do not attempt it in your own home. But ironically, the book is less about the end of the world as it is about the unlikely duo and others who hope to stop it. After spending several thousand years on earth together, the demon Crowley and angel Aziraphale have developed an adversarial friendship. This friendship solidifies as the end of times begins, as neither one of them wants to give up their worldly assignments. A quick, nice and accurate recap of Good Omens. With the birth of the Antichrist, the angel and demon decide to nurture the child, exposing him to the balance of good and evil and believing free will might somehow circumvent the end of the world. They may have succeeded too. Except for one small problem. The boy they intended to influence was not the boy. The real Antichrist, Adam Young, was growing up without the direct influences of good or evil. For all intents and purposes, he is a normal boy, perhaps a little brighter than most. And perhaps nothing would have changed had he not received a hell hound on his eleventh birthday, who he creatively names "Dog." That, and meeting with his neighbor, Anathema Device, the direct descendent Agnes Nutter, who predicted future events with such accuracy that her book of prophecies flopped on the heels of less accurate prophecies written by the likes of Nostradamus. When Anathema gives Adam a stack of tabloid magazines, everything he reads becomes real — including Elvis happily humming while he cooks hamburgers in a fast food restaurant. Meanwhile, Pratchett and Gaiman introduce the colorful characters of The Four Horsemen of the Apocalypse. They include: Scarlett, a red-haired vixen and war reporter; Sable, a best-selling author of a diet book; Mr. White, who gleefully admires polluted creeks and oil tankers; and Death, a presence that is nowhere and everywhere all at once. What makes their introduction delightful, much like the effects of angels and devils, is the commentary attached to all our modern niceties. They will eventually gather at a roadside cafe, before eventually heading out to meet the Antichrist at a nearby Air Force base. What they don't know is that Adam will not arrive alone. With him are his three lifelong friends: Pepper, Wennslydale, and Brian. Likewise, Adam's vision of the end of the world has very little to do with biblical propositions. Instead, he would be content enough to abolish teachers and rules for children. Adam isn't the only one to express how his thinking might muck up the ineffability of any divine plan. Newton Pulsifer, a private in the Witchfinder Army, falls for Anathema, a self-proclaimed witch. And Witchfinder Sergeant Shadwell warms to physic Madame Tracy. A brief, nice and accurate recap of the authors of Good Omens. Neil Gaiman was originally a frequently rejected writer whose first published work was a throwaway biography of the band Duran Duran. He has since written dozens of bestsellers and comic series. Most recently, his books Stardust and Coraline were adapted into very imaginative and successful films. You can learn more about the author on his website. Terry Pratchett had his first short story published when he was thirteen, with the proceeds of the sale being used to buy his first typewriter. Still, Pratchett struggled as an author until developing the amazingly rich Discworld series as well as several other best-selling novels. Last year, he was appointed a Knight Bachelor "for services to literature." He has also been a champion for Alzheimer's, suffering from the affliction since 2006 (see the video too). Visit his website. 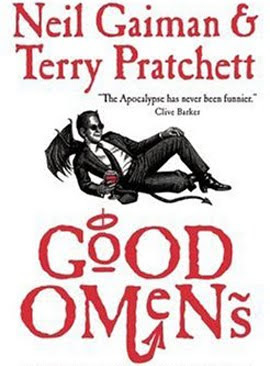 A few years ago, Pratchett added to the mythos of Good Omens by sharing New Year's resolutions by Crowley and Aziraphale. Crowley makes eight, including one to stop Googling himself. Aziraphale has eleven, including being nicer to Gabriel. Good Omens Shows Us The Signs With 8.6 On The Liquid Hip Richter Scale. While Good Omens is a novel that tells a story more than it shows one, there is no mistaking it is one of the greatest collaborations in two decades. Good Omens works on many levels, especially in its theme developed around the preconceptions of good and evil as well as how disasters can change people's lives, often for the better. You can find Good Omens: The Nice and Accurate Prophecies of Agnes Nutter, Witch on Amazon. Good Omens was released last year as an audiobook, brilliantly read by Martin Jarvis. Labels: Books, Good Omens, Neil Gaiman, Rich Becker, Terry Pratchett, William Morrow Co.